So soon after saying goodbye to Sophia, we are now saying goodbye to Dorothy. 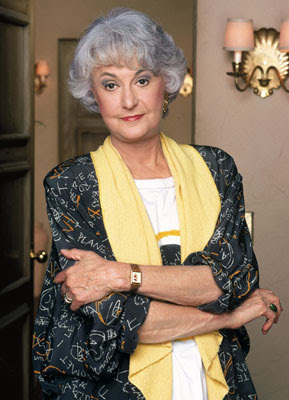 If you are my age, you know there was a lot more to Bea Arthur than just the Golden Girls. My earliest memory of her is from an appearance on "All in the Family" in which she plays Edith's cousin, Maude, who comes to the rescue when everyone comes down with the flu. The resulting debate with Archie over the merits of FDR remains a classic and is one of my favorite episodes of the series. Her chemistry with the cast of "The Golden Girls" - especially when playing off of Betty White - was simply amazing to watch. Entertainment Weekly posted a great tribute to her tonight that says it all much better than I ever could (http://watching-tv.ew.com/2009/04/bea-arthur-maud.html). The impact she had on the television shows we watch today is far-reaching. She pioneered the "strong woman who doesn't take crap" on the screen and in real life. Hopefully she will tell Estelle Getty hello for all of us.